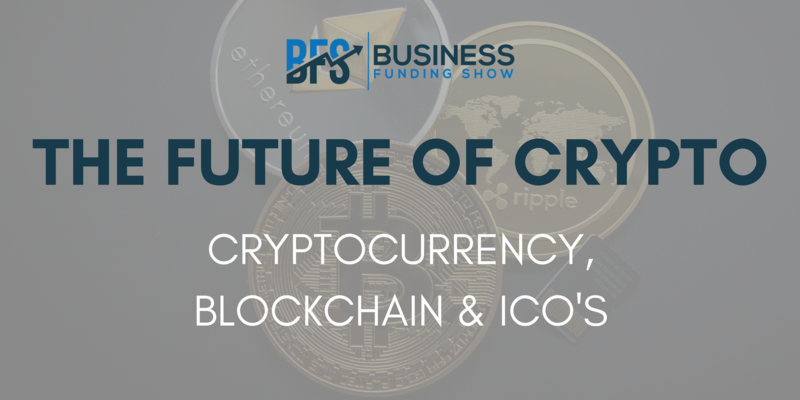 We at the Business Funding Show wanted to spend some time to focus on the hot topic of the crypto industry. Cryptocurrencies and blockchain are changing the very structures of our financial systems, and recently, ICOs have been causing major excitement in the business funding landscape. With the help of Andrew Adcock of crowdfunding platform Crowd for Angels, Rupert Barksfield from crypto investment fund The Crypto Crowd, as well as Tazz Gault from blockchain accelerator StateZero Labs, we have looked at some key considerations regarding these topics. It has to be noted that the cryptocurrency market is relatively small in the grand scheme of things; the current market cap lies at $300B. To put this into perspective, Canary Wharf trades $2T every single day. The difference is substantial. Despite this, the crypto space continues to attract a huge following and sentiment, as well as wide daily media coverage, all of which are quite telling signs. People are interested, and the level of excitement about this industry is palpable in society. As Rupert pointed out, 'Everybody is going to be coming into this market, and as soon as more regulation comes into place – bringing a higher level of security – a lot more institutional money is going to be flowing into it'. And indeed, already we are seeing that institutions are getting ready for this scenario. According to Rupert, 'The majority of institutional investor have crypto desks now. Regardless of how they appear in the media, we know for a fact that they've got crypto traders working in-house'. He pointed out that there isn't much doubt VCs want to be involved: 'I believe there are around 20-30 crypto and blockchain sole focused funds out there. I don't see VCs shying away from it'. Andrew explained that 'With the adoption of self-regulation among firms seeking capital, best practises and regulatory bodies discussing the topic, VCs do see potential in the market'. When speaking about UK VCs in particular, Andrew had stated that although the interest is certainly there, the investments are usually 'spearheaded by a small team' and are not as large as the 'typical' daily investments they consider. The bottom line is that 'we have yet to see a traditional goliath enter the space'. There is certainly an appetite, but it's based on the right product and the right people. VCs are essentially just playing their usual game; they're doing their proper vetting and due diligences. The key difference between an ICO, and crowdfunding for example (which it is often compared to) is liquidity. If you are investing into a company through Seedrs or Crowdcube, you are essentially getting a share certificate. You can sell this certificate on, but it's quite slow. When you're investing into a coin, you could sell that share instantly. You can essentially liquidate the entire asset, feasibly in some cases with a 10x return within a few months, as opposed to waiting a 3 or more years. The other aspect is accessibility; it doesn't matter where in the world you are, how much money you have, or whether you have an investment broker. Essentially – if you have an internet connection, you can participate. 'Token Sales seem to be the natural progression of a wider trend we're seeing: technology is making it easier and easier for your average person to have better access to more sophisticated forms of investment' – explained Tazz. The key thing to remember, however, is that ICOs/TSs do not grant you an equity stake in a company, but rather a utility token. This allows you to have an action on that company or the software that they're building, but there's no security beneath it. As the token increases or decreases in value, so does your investment. It is apparent that certain people are very swept up in the excitement of this new technology, and in 'being the first' to utilise it and invest. The problem is that they forget to do their proper research and due diligence on the company, product and market fit. The actual production, or the digital minting of these coins is very easy; it can all be set up and ready to go in a couple of days. The biggest thing you have to choose is which blockchain you want to have your token based upon – most opt for the Ethereum blockchain because it's the biggest and most well-known. However, simply producing a token doesn’t mean that it has a value in the ecosystem. Good tokens have a purpose or fill a void and therefore take time to develop, time to audit and have on-going support from its community. As Tazz stated, 'there is a vast difference between a sophisticated company (that is creating real value and has a well thought out token economic model) and otherwise'. If there is little support from the community, or a lack of development from the project, then the price will decrease. It is a market and therefore the price is determined by buyers and sellers. The difficult part of an ICO is the marketing. Just like a crowdfunding campaign, you have to market it hard. The difference here is that you're marketing to a global audience. The challenge of this lies in the fact that each segment of this audience has a different way of looking at and thinking about your product. You really have to get on the road and seethese different audiences. Taking this into consideration, it can be particularly difficult doing a large ICO raise. If doing a small one (circa £100K - £1M), you've got to ask yourself if it's even worthwhile – what is the reason for choosing ICO instead of utilising other funding? In the UK, there is very little restriction regarding investing into an ICO. Anyone can do it, and spend as much or as little money as they like. UK's regulation has not kept up with the large appetite of investment, which, as Tazz related, has resulted in 'the majority of UK projects being set up in other countries around the globe where there is more regulatory certainty'. However, UK regulators are starting to make moves in the right direction, which will hopefully 'stem the outflow of talent'. As the founder of a crypto fund, Rupert also relates that there is regulatory change on the horizon regarding the way funds are run. As a sophisticated investor, you can invest into any fund you like, crypto or otherwise. The change however, will come in the way FCA regulates advertising to retail investors (who are investing much smaller amounts), as this market is likely to become much more popular in the near future. Andrew assures that the UK is ultimately a great place to be: 'We have a considerate regulatory authority, favourable tax rates, rational business practises and a diverse culture that connects the world’s community'. This is especially true taking into consideration the very hostile attitude towards ICOs taken up by US and Chinese regulators, with China placing an outright ban. However, because 'the firms are mostly technology focussed, the workforce mobile, and the currency digital – geo-location is not a limiting factor', concludes Tazz. All our interviewees agreed that the applications of blockchain technology are by no means limited to fintech. 'We're starting to see the two diverge now, with the technology itself having far longer lasting impact than any one token', said Tazz. She was careful to point out that StateZero is interested in blockchain for business sense, and not just for the sake of it: 'We're after companies solving a real business problem, who utilise blockchain as the absolute best technology to do so. It's not solely cryptocurrency related, and it's a need to have, not a nice to have'. The use cases for blockchain are popping up in new industries all the time: from stopping fraud and corruption in the distribution of humanitarian aid, to tracking the provenance or 'life cycle' of single car parts in manufacture supply – having an unbreakable chain of information can in fact be extremely valuable. The crypto industry is in fact in a general growth phase right now, and as Rupert said, hopes to hit a $15T market cap in about 5 years. A crash might come, as it inevitably does, but Rupert strongly believes that the industry will come up bigger and stronger. Meanwhile, national cryptocurrency adoption is already happening in places like South Korea, Turkey or Sweden, while in the UK, governor of the Bank of England Mark Carney has come out in favour of the idea. A standardised, unified world-wide currency is also believed to be possible in the long-term. The slow introduction of reasonable and smart regulation should also entice institutional investors to play a much bigger role in the market; once the big money starts coming in, we might see a boom the likes of which the crypto market has not experienced before – and we might just be on the verge of it. Crowd for Angels is a UK crowdfunding platform that offers companies and investors opportunities to raise and invest funds in different projects. Their crowdfunding opportunities include shares (equity), crowd bonds (debt) and token sales (cryptocurrencies). The CryptoCrowd is a crypto investment fund for retail investors, as well as a platform which educates and incentivises users to research and make predictions on the market. Their app is set to launch in March 2019. StateZero Labs is a blockchain accelerator currently open for applications, which close at the end of November. They're looking for six companies, and offering a £50K grant, taking absolutely no equity. Looking for funding? Whether you'd like to utilise grants, educate yourself on all your equity options, or simply network with a selection of top funders and service providers, we have something which will suit your needs! Click here to check out our event listings. Have bigger ambitions? Why not join us at our flagship funding expo featuring all funding and growth opportunities under one roof.